The city of Philadelphia is a very lively and vibrant place with hundreds of attractions and alluring cuisines, so it is hard to imagine needing to leave the city. That said, locals and seasoned visitors know that southeastern Pennsylvania has much more to offer than big city living in Philadelphia. The greater Philadelphia area is filled with history, beauty, family fun, and more—all within about an hour. The best way to visit all of these attractions is by car, but public transport and rideshare options are also available for some destinations. This Revolutionary War encampment turned national park is just a short 30- to 40-minute ride from Center City. Here you can enjoy a leisurely walk around nearly 3,500 acres of preserved land, while learning about the struggles faced by George Washington’s Continental Army during the winter of 1777. Valley Forge has a large visitors center and many historic structures that provide a detailed look at life at Valley Forge and in Revolutionary America. A short 15-minute drive away from Valley Forge is the King of Prussia Mall, the largest mall in America. King of Prussia (KOP) hosts more than 400 retailers including a large number of luxury brands, as well as high-end restaurants. KOP boasts close to 3 billion square feet of retail space, so you are sure to find stores and restaurants to fit any budget. There are also a number of affordable hotel options nearby, as well as SEPTA bus service to and from Philadelphia. If you are looking to escape the hustle and bustle for the day and commune with nature, Longwood Gardens is the perfect place. 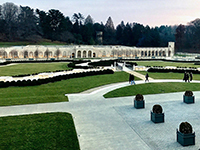 Located about 45 minutes from Philadelphia, Longwood Gardens is just over 1,000 acres of gardens both indoor and outdoor, full of exotic plants and trees all precisely maintained and arranged. On the property you can stroll through a massive conservatory; explore various gardens and fountains outdoors; and learn about the land’s history at the visitors center as well as the owner’s former home, now a museum. Feeling lucky? Try your luck in Atlantic City, a beachfront hotspot on the New Jersey coast that is known for its casinos. Many casinos connect to the boardwalk where vendors sell boardwalk food, like funnel cake and fries, overlooking the beach and Atlantic Ocean. There is also a tiny amusement park on the Atlantic city boardwalk with carnival-style games. If you are looking for a more family-friendly location or quieter place to relax on the beach, try one of the other Jersey Shore towns. 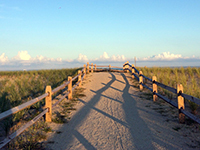 Ocean City is a popular location with its expansive boardwalk spanning 22 blocks, with shops, restaurants, and two large amusement parks with roller coasters, rides, and games. The Jersey Shore is also home to many wineries, breweries, and distilleries. Most are located around Cape May, the most southern tip of New Jersey. I recommend an overnight stay in Cape May, as it is a bit further from Philadelphia. It might take more than a daytrip to enjoy the wineries, the beach, and downtown. This quaint town is just about an hour from Philadelphia to the northeast, right on the Delaware River. New Hope offers diverse eclectic shopping with many local art galleries and small businesses filling the majority of its main street shops. Restaurants serve a wide variety of cuisines from around the globe. Downtown New Hope is very walkable and neighboring Lambertville, New Jersey, is just across a walkable bridge. Both towns are known for their diversity and liberal atmosphere and have become a popular spot for many in the LGBTQ+ community. 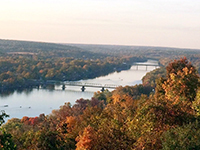 New Hope and Lambertville are great places to spend a casual afternoon walking around and exploring a unique slice of small-town America.